Experts have been saying DRAM is on its last legs for some time. Looking at the recent exploits of IBM Research and Samsung we could start seeing its replacement soon. Last week, the two companies published a paper detailing the next generation of MRAM meant to replace today’s common NAND-based memory. MRAM is short for Magnetoresistive Random Access Memory. It’s a semiconductor type of memory that stores data using magnetic spinning. NAND, on the other hand, is the flash memory commonly found in our everyday wearable and mobile devices. According to the researchers, the most recent MRAM drastically improves memory performance. If it reaches the consumer devices it equals more storage, better speed, and improved battery life. The two companies are using a technique called spin-transfer torque to build the circuits used for their memory. It’s created with 11-nanometer production technology and uses but 7.5 microampere worth of electricity. Daniel Worledge, a scientist and MRAM team senior manager at IBM Research, says that it’s 100,000 times faster than writing data in NAND-flash, and requires no more than 10 nanoseconds. Reading data isn’t as huge an improvement, but still bolsters an impressive improvement, being 10,000 times faster than conventional memory. To be clear here, the idea here isn’t to replace DRAM but flash memory. As you may have noticed, the benefits of using the technology are big, but it’s not limited to improving the speed. The technology has unlimited read and write cycles as well as inherent non-volatility. That means the memory remembers the data stored in it despite turning it off and on again. “With these capabilities a single MRAM chip can replace a combination of SRAM and flash for many ultra-low power, medium performance mobile and Internet of Things applications,” says Worledge. 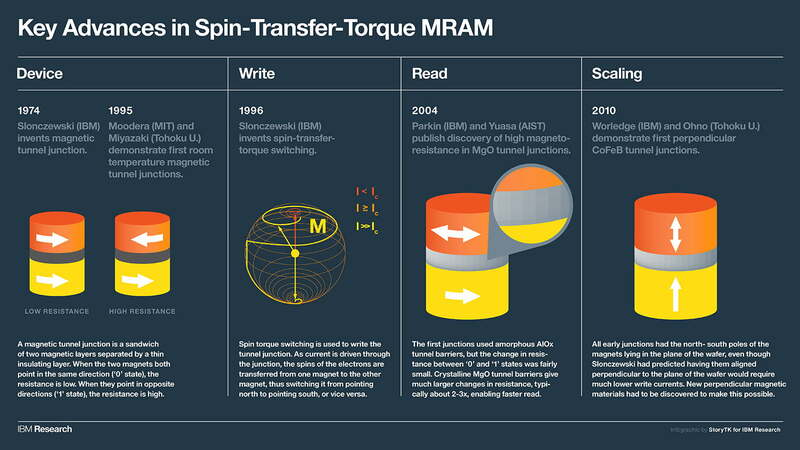 “However, our long term goal remains to scale Spin Torque MRAM to be so dense and fast it can be used as a cache memory in IBM’s servers.” As an effect of these benefits, data wouldn’t need to be deleted before being rewritten. MRAM isn’t the only new memory technology on the block, however. Intel last year revealed 3D XPoint, a non-volatile memory option that could nearly meet DRAM speeds. Its performance is not as impressive as what MRAM touts, but Intel’s much closer to production. Drivers are expected to become available late in 2016. IBM hopes to, together with an industry partner, get mass production rolling in three years. However, whether that partner ends up being Samsung, or another company, is unclear.